The conquest of Chichen Itzá by Hunac Ceel and his allies is without doubt one of the most interesting and puzzling episodes in Maya history. It might well be called the Trojan War of Yucatan, for tradition ascribes as its cause the theft of the wife of a powerful ruler by the chieftain of another great and famous city. As in the case of its classical counterpart, the immediate cause of the trouble may have been the abduction of the wife, but the struggle doubtless originated in political jealousies of long standing and the desire of one city to obtain control of economic resources previously enjoyed by another. From about the year 1000 A.D. the three cities of Chichen Itzá, Mayapan and Uxmal had ruled over the rest of northern Yucatan, and there is evidence that the most powerful of them was Chichen Itzá. 1 Then late in the Twelfth Century, Hunac Ceel, the ruler of Mayapan, organized a conspiracy against Chichen Itzá, as the result of which he conquered the latter city aided by seven foreign Mexican captains and probably also by the people of Izamal. The consequences were far-reaching. Not only was there a permanent readjustment of the political forces of northern Yucatan by which the country was governed solely from Mayapan for the next two centuries and a half, but also it resulted in the migration of a considerable portion of the Itzá nation to the distant region of Lake Peten in what is now the Republic of Guatemala. The outstanding personality of the episode was Hunac Ceel. 2 Although we do not know the details of his conspiracy, it is evident that he played a sinister part in the affair. Incomplete accounts of the event occur in the formal chronicles of the Books of Chilam Balam, and confused details are also contributed by the fragmentary historical narratives which are to be found in these manuscripts. The episode still remains a puzzle, because these details are given in a more or less incoherent form and it is difficult to determine the order in which they occurred. In the second Chumayel chronicle we read: "then came the treachery of Hunac Ceel. Their town (Chichen Itzá) was abandoned, and they went into the heart of the forest to Tan-xuluc-mul, as it is called." This is important, for Avendaño locates this place near Lake Peten, around which the Itzá were living at the time of the Spanish Conquest of Mexico and northern Yucatan. Here they maintained their independence until the close of the Seventeenth Century. They told Father Fuensalida, a Spanish missionary who visited them in 1618, that they had come there from Chichen Itzá. According to their story, in a certain Katun 8 Ahau one of their rulers at Chichen Itzá stole the bride of another more powerful chieftain during the wedding festivities. Fearing the consequences of the act, the offender and his subjects abandoned their city and retired to Lake Peten. 2 The connection of this event with the Hunac Ceel episode is further confirmed by the historical fragment in the Book of Chilam Balam of Mani which tells of the same affair. Here it is stated that an unspecified person "sinned against Ah Ulil, the ruler <of Izamal>, against the wife of his fellow-ruler." 3 We conclude that it was the ruler of Izamal whose bride was stolen. Why it was Hunac Ceel and his Mexican captains who avenged the offense by the sack of Chichen Itzá, and why the Maya chronicles ascribe the trouble to the treachery of Hunac Ceel, is a problem which the writer is unable to solve. supported by the mural fresco in the Temple of the Warriors at Chichen Itzá, where we see the sacrifice of a human victim who lies stretched across one of the coils of a huge plumed serpent. 1 We can find no confirmation for the possibility that there was a sacred serpent at Chichen Itzá which was actually fed with human victims. FIG. 45--Typical Itzá priest. Temple of the Warriors, Chichen Itzá. Drawing by Ann Axtell Morris. time down to the fall of the latter city in the middle of the Fifteenth Century we find Mayapan enjoying the hegemony of all northern Yucatan. After the end of the Twelfth Century we hear nothing more of Chichen Itzá as an important political power, but its sacred cenote continued to be a center of pilgrimage down to the time of the Spanish Conquest. 177:1 Relaciones de Yucatan, I, pp. 120, 147, 176, 200, 214, 225, 242 and 270. 177:2 The episode of the Sacrificial Cenote, recorded in Chapter II and discussed in Appendix B, shows that Hunac Ceel was an unusually bold and resourceful person. 177:3 This expression, u keban-than Hunac Ceel, can in the writer's opinion be translated only as the treachery or plot of Hunac Ceel. It has usually been translated as the plotting or treachery against Hunac Ceel, although Brinton admits that the former rendering seems more correct (Brinton 1882, p. 129). 178:1 Maya, uahaluah. The writer agrees with Brinton and Martínez who have translated this as banquet. It must be admitted, however, that the word could also mean an abundance of bread. 178:2 This was thirteen katuns after the Itzá were driven from Chakanputun. 178:3 Brinton 1882, p. 97. Cf. Chumayel p. 137, note 4. The writer believes this to be a reference to the questionnaire given in Chapter IX, the so-called naat. An alternative translation is possible: because they were so given to understand; but we are told that Chac-xib-chac was trampled upon, and this was one of the usual penalties for not being able to answer the questionnaire. Cf. Tizimin MS. pp. 22-23, also p. 93 of the present work. 178:4 Relaciones de Yucatan, I, p. 269. 178:6 Means 1917, p. 132. 179:1 Brinton 1882, p. 129; Landa 1928, p. 80; Herrera 1726, decad. 3, book 6, chap. 3. Cf. p. 66, note 11. 179:2 Cogolludo 1868, book 9, chap. 14; Villagutierre Soto Mayor 1701, p. 30. 179:3 Codex Perez, p. 120. "tumenel zipci ti Ah Ulil ti chuplal yatan yet-ahaulil." 179:4 Codex Perez, pp. 120-121; Tizimin, pp. 22-23. 179:6 Cf. p. 67, note 2: Tozzer 1907, p. 94. 180:1 Morris, Charlot and Morris 1931, Plate 145. See figure 44. 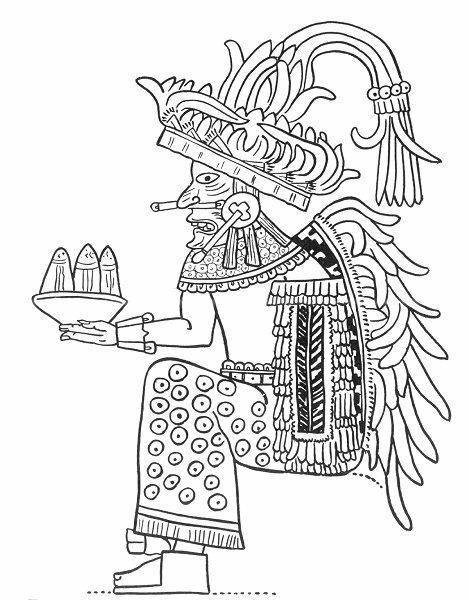 Here, however, the serpent appears to be Kukulcan, and not Hapaycan.